The interdisciplinary Chemistry-Biology Interface (CBI) Training Program at the University of Wisconsin-Madison uses National Institute of General Medical Sciences funding to train eight students in chemical biology who are earning doctoral degrees in bacteriology, biochemistry, biomedical engineering, biophysics, chemical and biological engineering, chemistry, molecular and environmental toxicology, pharmaceutical sciences, pharmacology, plant pathology, and other fields. The CBI Training Program is one of the largest and oldest in the country. The program was initiated to provide outstanding graduate students with an opportunity to broaden and deepen their knowledge of research opportunities and advances at the chemistry-biology interface. This vision was prescient. 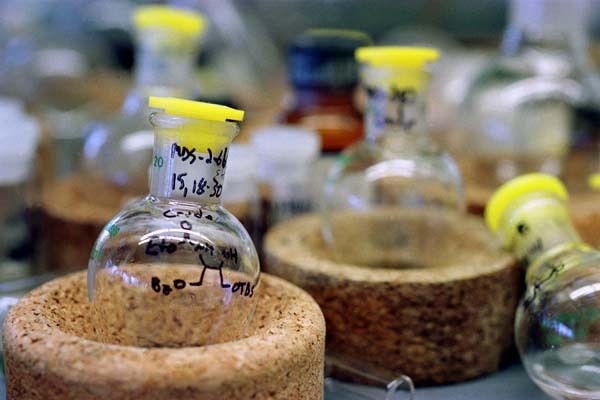 Concurrent advances in chemistry and biology have rendered the chemistry-biology interface one of the most exciting and innovative research areas. Our CBI program is designed to provide interdisciplinary education for the future leaders in this area. The goal of this training grant is to provide students with interdisciplinary training in synthetic and mechanistic aspects of research at the chemistry-biology interface. to facilitate the education of scientists who can identify emerging research areas and devise innovative solutions to problems by combining traditional chemical and biological approaches. The program provides stipends for up to two years, funds to cover tuition and research expenses, and travel funds to attend conferences. The program also offers valuable first-hand experience in a specific field. For more information about chemical biology at UW–Madison, see chembio.wisc.edu. For an overview of the program, visit the National Institutes of Health. Download a brochure about the benefits of becoming a CBI trainee (.pdf). Please include this CBI Acknowledgement Text in trainee publications.